As far as moorings are concerned, the times they are a changing. Ten years ago, Hurricane Bob swept up the New England coast destroying hundreds of boats, most of which had been on moorings. 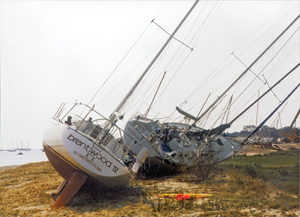 Some of the damaged boats came to grief because lines chafed, but many more were wrecked because the mooring anchors—half-buried mushrooms and inadequate dead weight anchors—proved to be woefully inadequate in the face of Bob's wind, waves, and tidal surge. Then, as a sort of meteorological one-two punch, the Halloween Northeaster pounded the New England coast, popping out even more moorings. The past decade has seen many technological advances in boating, not the least of which is a greatly improved anchor for moorings—the helix. Depending on the harbor bottom, traditional mooring anchors, both mushroom and dead weight, had tended to sit on top of or just below the surface. Theoretically, the holding power of a mushroom anchor can be increased up to tenfold once it becomes buried sufficiently in mud. In most harbors, though, a mushroom anchor might be buried a foot or two in a mud bottom and is usually canted to the prevailing winds. If a storm comes out of a different quadrant, the mushroom is easily popped out. Mushrooms also don't do well in silt bottoms or in denser bottoms, like sand or clay. In the latter, the mushroom tends to sit on or near the surface and must rely solely on its weight to anchor the boat. A dead weight anchor may gain some advantage from suction in a mud bottom, otherwise it's holding power is completely dependent on its weight, or more exactly on it's submerged weight, which in the case of a concrete anchor is almost half its dry weight. Another factor is scope, which has as much to do with holding power of a mooring as the anchor itself. Studies have found that when the angle of pull increases to 25°, a mooring's holding power begins to weaken precipitously. So in shallow harbors, where a scope of 3:1 can be had with, say, 20' - 30' of chain, the advantage of scope is all but eliminated in a storm by a combination of tidal surge and the high, pumping motion of waves. Installation of a helix, unlike a traditional mooring, requires expertise and special hydraulic equipment. The anchors are made by A. B. Chance Co. of hot-dipped galvanized steel with 1 3/4"shafts and either 8", 10", 12", or 14" diameter helices. Extenders can be used to drive the mooring further into the seabed for additional holding power. Royce Randlett, Jr., president of Helix Mooring Systems Inc., says the company has installed over 3,000 helix anchors plus a similar number of a smaller (5' 6" with a round shaft) "lighter load helix anchor with a single helice. The latter is installed by a diver and is only suitable for smaller boats. The helix isn't infallible; there have been several cases where helix anchors have pulled out. In one case, the helix was being used to secure a 72' sailboat in Marion, Massachusetts during an especially fierce northeaster. While a helix requires less scope than a conventional mooring, this helix had almost no scope because of the storm's surge, according to George Jennings, who was then the harbormaster in Marion, and was pumped out of the bottom by the boat's fore-and-aft rocking motion. In another case, a helix let go because it was installed by someone who was inexperienced and drove it only part of the way into a rocky bottom. One of the problems has been that the number of people who are qualified to install helix anchors; there are only 20 installers, mostly in the Northeast, with a handful in other states—Maryland, Florida, and Washington. 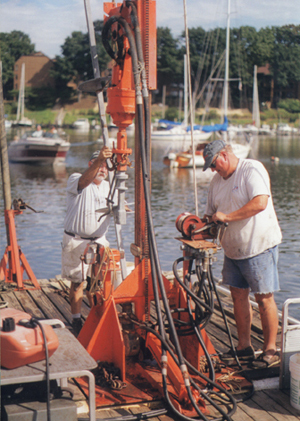 Ham Gale, who installs helix anchors in the Annapolis , Maryland area, uses a specially-designed platform—a raft—for the hydraulic installation equipment that can be towed to the spot where the mooring will be installed. Two long metal pipes—called spades—at the ends of the platform are then lowered into the harbor bottom to anchor the platform and prevent it from twisting while the helix is being screwed into the bottom. The holding power of a helix is ultimately based on the density of the bottom and it's depth into the bottom. Using a pressure gauge, an installer can estimate a helixes holding power by translating pounds per square inch to torque. If a helix goes into the bottom too easily, Gale says the installer can add an extender to take it down further to firmer soil. Most installations take about an hour. The cost for a large helix is about $2,000 and about $1,500 for a medium helix. In his case, Gale has installed over 300 helix moorings, including 48 at the U.S. Naval Academy in Annapolis. Gale says he's never had one pull out.